The Carlisle Circulator features a front-end rack that holds two bikes. The League of American Bicyclists has presented Dickinson College with a silver Bicycle Friendly University designation award. Dickinson joins 100 other cutting-edge higher-education institutions in 37 states and Washington, D.C., that have worked to make their campuses and the communities that surround them more bikable. As a Bicycle Friendly University, Dickinson will have access to free tools and technical assistance to help it make the campus even more bicycle-friendly. Dickinson is just minutes from the midway point of the Appalachian Trail, the Cumberland Valley Rail Trail and the world-renowned Yellow Breeches Creek and LeTort Spring Run, all of which are just a bike ride away. And while bicycling is not only an easy, affordable option for transportation, it also forges a connection to the outdoors, helps decrease the college’s carbon footprint and is part of a healthy and sustainable campus culture. The Handlebar — A campus bicycle co-operative run by volunteer students, faculty and staff. The “learn to fix it yourself” model provides the college community with new and used bike parts and training for all repairs. Green Bikes — Students, faculty and staff can have semesterlong use of one of the more than 55 Green Bikes, built by volunteers from The Handlebar, for a $25 refundable deposit. 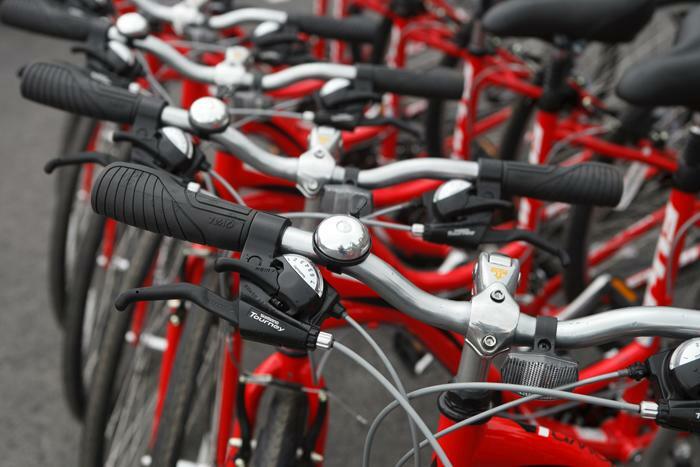 Red Bikes — Free use of the college’s signature Red Bikes is available to members of the campus community, as well as their families and visitors, for a few hours—or an entire day. This is perfect for errands, riding to the College Farm or riding the many trails in the Carlisle area. Bike Racks — Dickinson has invested in open and covered racks across campus to provide convenient and safe parking. There is also a Web site highlighting the many locations to park your wheels. Bike Storage — Dickinson offers free, secure, indoor, long-term bike storage over winter and summer breaks. Bike to Farm — The most popular biking event on campus each semester, Bike to Farm offers the campus community the opportunity to ride their own bike, or borrow a Red Bike, to make the seven-mile ride out to the College Farm, where everyone socializes, eats delicious dishes and relaxes by a bonfire. Bicycle Advisory Committee — This group of faculty, staff and students work to enhance the bicycle culture at Dickinson. The Cycling Club — This new club has the budget and equipment and is off to the races. Club members enjoy both training rides and races for road and mountain bikers. The Biking@Dickinson E-mail Group — With more than 300 subscribers, this group connects on everything from events, routes, rides, safety, buying and selling bikes. The League of American Bicyclists has been protecting the rights of citizens for safe and enjoyable bicycling since 1880, representing the nation’s 57 million bicyclists. The League provides education programs, helps create better biking environments, promotes bicycling and helps create bicycle-friendly places.